Creative Technology has once more pushed the boundaries of LED display technology with the introduction of their G10 Carbon Fibre LED system. CT's latest innovation is a full colour, high brightness, super lightweight 10mm LED display weighing a mere 11kg per sqm. At less than half the weight of previous comparable systems the G10 offers massive advantages in terms of production opportunities and reduced freight costs. The extraordinary weight saving means a native resolution HD screen measuring 207sqm can be built weighing only 2.3 tonnes. Alternatively typical on stage effects and Imag screens for touring applications of 5x3m (16x9') will weigh less than 225kg (500lbs). Screens can now be tracked, rotated and flipped using simpler rigging and mechanics, greatly reducing production costs and increasing impact. The light weight and low volume design has similar advantages in terms of truck space and shipping weight. A standard flight case contains enough equipment to build a 10sqm display. 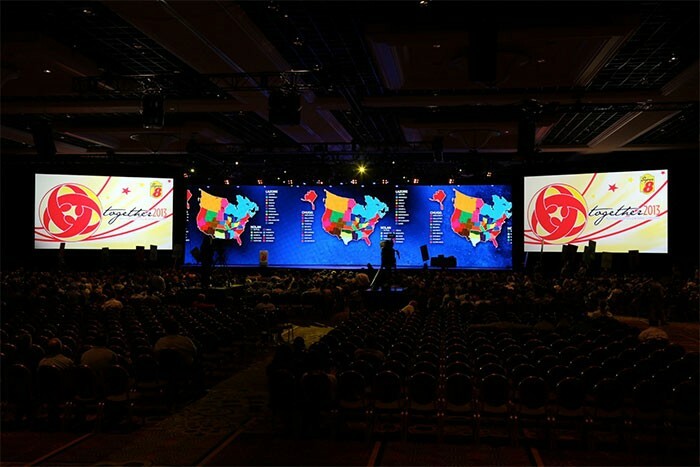 Several screens of this size can be transported in a light van and a full size truck can carry enough G10 panels to build a staggering 720sqm display. An initial investment of over 1,000 of the 1x0.5m (39x18.5") panels have been or are scheduled to be used on several major events in the US and Europe. One of the first outings for the G10 was for Wyndham’s Hotels for the company’s annual corporate conference held at the Mandalay Bay Hotel and Casino in Las Vegas. Contracted by L2K Communications who conceptualised a superhero themed stage entrance for Eric A. Danziger, president and chief executive officer of the Wyndham Hotel Group, CT provided the screen in three sections with two 14 wide x 12 high side screens shouldering the 4 x 13 high centre section configured as a drawbridge that lowered for the CEO’s grand entrance. The following day the screen was moved out of the general session to another hall at the Mandalay Bay Hotel. The conference closing dinner and entertainment for the Wyndham's staff and partners featured an Indian dance troupe followed by a set by American country music singer, songwriter and actress Carrie Underwood. For both events the screen was configured as one 14 wide by 13 high section. Commenting on the first shows to be completed in the US, Graham Andrews, president CT North America and Asia Pacific, commented: "The light weight, speed of deployment and image quality of this product has been incredible. We believe it will be a real game changer in how medium resolution LED can be applied to shows from the largest corporate or entertainment application to small displays in TV studios etc." Dave Crump, CEO of Creative Technology in Europe and the Middle East added: "Getting this product to market has been a tough challenge; we have worked closely with the manufacturer to produce a hybrid version of their standard product which offers significant improvements in reliability and functionality. This has been done against some very tight deadlines. We look forward to seeing and sharing the results on some incredible projects in the coming months." In addition to the UK and US’ businesses, the G10 will also be available through CT's operations in the Middle East and Asia Pacific later this year.